When it comes to souring and supplying high-quality parts for all types of commercial vehicles, nobody does it better than Midland Truck & Trailer Spares, who opened a second parts store in August, 2016 to complement their contract with National Vehicle Distribution (NVD). We caught up with director Fergal Mulligan to get an update on the progress being made by this expanding operation. Established by Fergal Mulligan in 2000, Midland Truck & Trailer Spares quickly established itself as Ireland’s premier nationwide end-user supplier of truck and trailer parts and axle and suspension components, with the outstanding success of the company built on a policy of consistently delivering high levels of customer service. “We’re now the one-stop shop for parts for the NVD fleet and have opened up a 2,200 square feet stores on their premises in Baldonnell since 2016, where we have one full-time employee,” Fergal confirms. “We had been supplying NVD prior to that from our own stores (3,000 sq ft in Greenogue Industrial Estate, Rathcoole) but they did a revamp and built a new state-of-the-art garage in Balldonnell. As they were getting busier, they required full-time stores on site and we were only too happy to go into partnership with them. Midland Truck & Trailer now generates full-time employment for a team of seven. Their professional, experienced staff boast a high level of technical expertise and are fully motivated to provide complete customer satisfaction at all times. MTTS carry a comprehensive range of replacement truck, van, bus, trailer and car transporter spares, stocking parts from renowned, industry-leading suppliers like Meritor, BPW, SAF, Schmitz Trailer, Textar, Wabco, Mann Hummel, Hella, Febi, Universal Components, Knorr, Sachs, etc. They also carry in stock a complete range of accessories for virtually all makes and models of commercial vehicles on Irish roads today, offering same-day delivery in Dublin and next-day delivery nationwide. 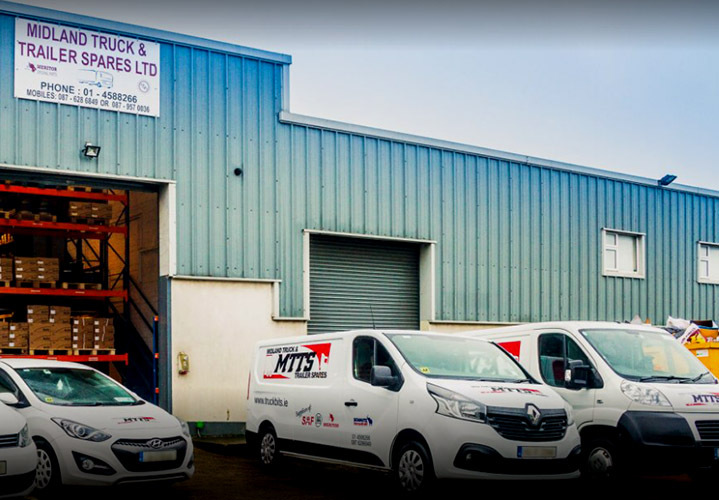 Counting numerous blue-chip and semi-state companies amongst their regular customer base, Midland Truck & Trailer Spares’ well-appointed, easily-accessible 3,000 sq ft HQ in Rathcoole, just off the Naas Road and close to the M50 and Lucan Bypass, is open from 8.30am until 6.00pm Monday to Friday and from 8.30am to 1.30pm on Saturdays. An afterhours service is also provided to make sure that no haulier is ever left stuck, with mobile phones always switched on in case a customer is in need of a part at night time or over the weekend. As for the key to his company’s continued success, Fergal believes that looking after customers is No.1: “It’s all about service. We look after our customers and that’s one of the reasons why NVD went with us. We are available around the clock, 24/7, because trucks don’t stop and neither do we. “Weekends are the busiest times in commercial vehicle garages when the trucks are off the road and that’s when there will be a big demand for parts. You have to make sure that you have everything and anything a customer could need. We carry a vast stock of parts. For example, for the NVD contract, we’ve had to take on new agencies for LOHR, ROLFO and Kässbohrer, who are the three main manufacturers of car transportation trailers. We carry everything that could possibly be needed from the back to the front and the top to the bottom of a truck or trailer. “We’re over a year with NVD now and we’re concentrating on improving that side of the business as much as we can. Overall, the aim is to keep expanding and to continue to become more efficient. The addition of Kevin McGuckin to the MTTS team has been another important recent development. “Kevin joined us two years ago to cover the southern part of the country. From Toomebridge, he is a former sales rep down south for SDC Trailers and he has a wealth of experience, particularly in the trailer business. That’s precisely why they keep coming back!